The town is famous for its high skyscrapers, for instance, the 27-story First Tennessee Plaza and the 24-story Riverview Tower , that are located on Gay Street. Another high-rise building is the 21-story Tower at Morgan Hill , the 18-story Andrew Johnson Building and the Knoxville Hilton , the 15-story General Building , the 14-story Holston , and the 12-story TVA Towers or Sterchi Lofts . One of the most famous constructions of the city is the Sunsphere , which is an 81-meter hexagonal steel truss structure built as the symbol of the 1982 World's Fair. The Tennessee Amphitheater built for the 1982 World's Fair is now an opened amphitheater located in the 1982 World's Fair Park, Knoxville, Tennessee. The downtown area of the city hosts building constructed in various architectural styles. Starting from the hewn-log James White House that was built back in 1786 and ending with the Knoxville Museum of Art that was built in 1990. The museum is located at 1050 World's Fair Park in Knoxville, Tennessee, hosts a collection of East Tennessee cultural objects and the new art items from the nearby regions as well. The overall architectural style of the city reflects the development of Knoxville over the centuries. For instance, William Blount Mansion , constructed in 1791, is an excellent example of Georgian style. Victorian and Bungalow/Craftsman architectural style might be noticed by looking at the Fourth and Gill, Parkridge, and Fort Sanders areas of the city that were developed in the 19th century. Lindbergh Forest and Sequoyah Hills automobile suburbs founded in the 1920s represent the Tudor Revival, English Cottage, and Mission Revival architectural style. 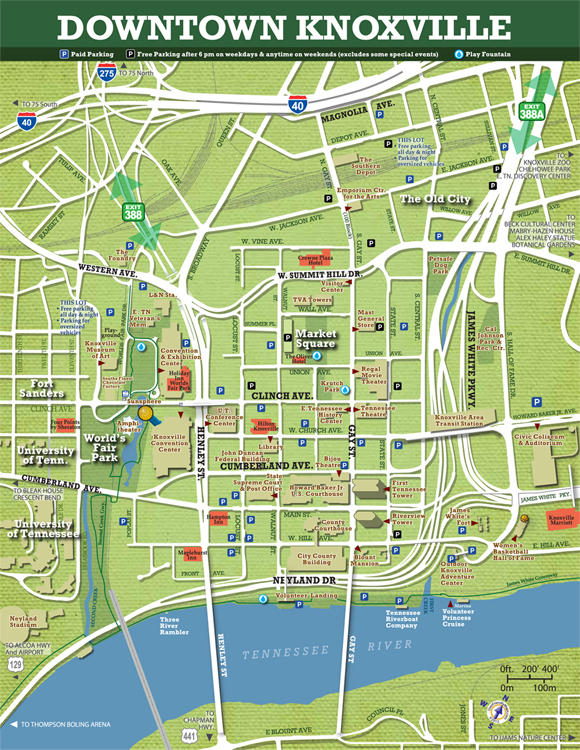 The city is divided into notable neighborhoods as Bearden, Chilhowee Park, Colonial Village, Cumberland Estates, Emory Place, Fort Sanders, Fountain City, Fourth & Gill, Island Home Park, Lindbergh Forest, Lonsdale, Mechanicsville, North Hills, Oakwood-Lincoln Park, Old City, Old North Knoxville, Parkridge, Rocky Hill, Sequoyah Hills, South Knoxville, and West Hills.